Time to talk about something relatively large. 25 meters wingspan large. Yep, it’s the Zephyr S. This is a rather new stratosphere drone that comes from Airbus and they have, in fact, opened up a production line for it. The main use for this type of drone is aerial surveillance, broadband access to remote regions, and reconnaissance. As such, a lot of technology needs to be used for this type of creation. Airbus understands this and they’ve created something incredible. The Zephyr can fly at an altitude of around 21km; above jet streams, clouds, and the ozone layer. The drone is unobstructed because air traffic flies at a lower altitude. Airbus is very optimistic and creative with their goals – 100 days of flight with no landing need and a travel distance of 1,000 nautical miles per day. This is ambitious, to say the least, but if anyone can do it, Airbus can. Here’s an interesting bit of info – the Zephyr weighs only 75kg which is almost the average weight of a human. However, the Zephyr is by no means a lightweight and can easily carry a load up to 5 kilograms. Airbus is sure to earn a lot of money from the deals between them and other parties for the Zephyr. In fact, the United Kingdom’s Ministry of Defence already made purchases of UAVs. At the moment, Airbus is looking to create a drone that would be capable of creating a communication network for both military and/or civilian uses. 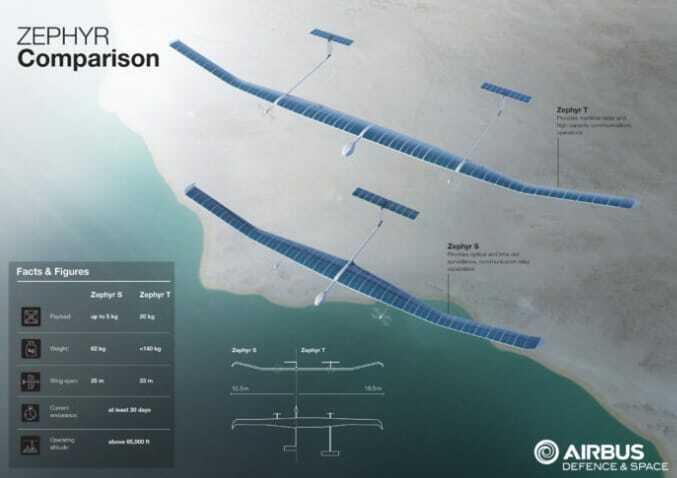 In the near future, we’ll probably see similar drones delivering Internet access to remote areas of the world. “The vision was there over ten years ago. What we’ve been waiting for and working on is the technology developments in different areas like battery technology and the solar array — for that to be ready and available to the standard we need to make this a really viable product. That’s where we are today”. It’s no surprise that Airbus is excited to be pushing out their first drone of this kind. It’s also evident that they’re constantly pushing the boundaries and looking for ways to make this technology even better. What’s the difference between Satellites and Stratosphere drones? Firstly, the drone is closer to earth so the images that get taken by the drone are much clearer and in higher quality than what you’d get from traditional (read obsolete) satellites. The latency with drones is significantly reduced (when talking about communications), not to mention the fact UAVs are also cheaper to create, release, and pilot than satellites. In a decade, we might see thousands of these drones flying above Earth’s surface. There’ll be many more photos of our planet, maybe even internet access at places that can’t get it traditionally. There’s all to play for here and stratosphere drones like the Zephyr S will advance technology many years. Who knows what kind of an effect these drones will have on our future, but one thing is sure – they’re here to stay. What do you guys think about Zephyr Stratosphere drones? Can you imagine yourself being in charge of creating, maintaining and piloting one of these bad boys? Let us know your thoughts in the comment section down below! DJI Goggles Racing Edition – What’s all the hype about? Typhoon H Plus – What’s been upgraded?